Best business case I’ve used! I’ll be honest, I love Wenger bags. I’ve got two of them, a Wenger Legacy 17” Triple laptop case and a Wenger Patriot 2-Piece Business Wheeled Laptop Briefcase. I bought my Wenger Legacy 17” laptop case about 4 years ago and it’s been in constant use ever since. It’s my go to bag for every day I’m in the office. I take it to London with me on the weekly train or plane journey and it’s never put a foot wrong. OK, Ok I hear you ask, so what’s so great about it? Well, let me show you. All the pictures in this review are of my own bag, taken the day I wrote this review. And as I mentioned it’s been in daily use for about 4 years! 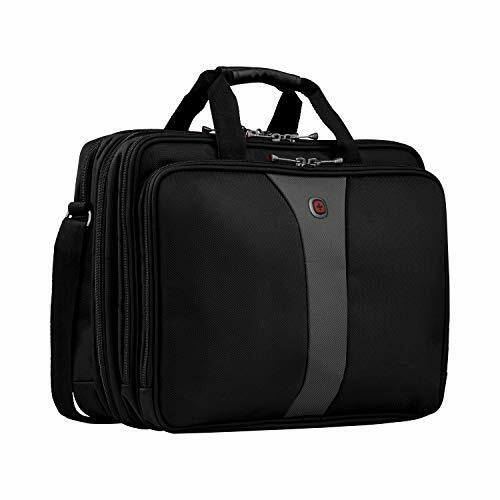 Still looks pretty good huh?Most of the workers compensation attorneys los angeles ca uses this laptop case for their office use and they have reviewed that this bag is totally good for professional use. In fact, in order to write this review and take the pictures, I had to completely empty it. As you can see here, it holds a lot. 17” MacBook, charger, Grid-It cable tidy (I’ll never leave home without one of these in my bag), various notebooks, pens, pencils, business cards, spare batteries, daughters letter to Santa, pay slips, toothbrush and toothpaste. The list goes on and on. It holds all of this and it’s not even half full. Everything is secure in one of the three main compartments. Which means that I can lay my hands on whatever I need in seconds and know that there’s limited chance of anything being damaged. The bag itself is tough. It’s made from very rugged material. I’ve had no instances of rips or tears to the fabric in 4 years. This is a bag that’s thrown about, rammed into overhead compartments on trains, and jammed into flight cabins on a regular basis. It’s suffered spills and drops and taken them all in it’s stride. There are two carry handles at the top, both of them stitched into the front and back of the bag, meaning that you’re unlikely to have an accident with anything coming loose. There’s a fully adjustable, padded shoulder strap which is secured at either end of the bag with high quality metal fasteners. The shoulder strap itself is shaped and padded to offer a comfortable carry, without digging in or causing shoulder pain even with extended use. Each of the three compartments are fastened with very sturdy metal zips, which can take a padlock if you so desire. I’ve never once had a zip burst on me, even when it’s been stuffed full of equipment and clothing on an overnight trip. Let’s look at the compartments in detail. As mentioned, there are three. The first front section, features several internal pockets, back pockets and a further zipped section to secure even more items. There’s a handy Velcro fasten middle section that’s perfect for holding USB sticks without them coming lose and getting lost down the bottom. It’s also worth mentioning the small hook clip that hangs down from the left hand side. It doesn’t look like much, but if you clip on your keys, you’ll never have to fish about in your bag again! It’s little touches like that that really makes the Wenger bags stand out. Not only is it a handy little feature, the red fabric adds a nice touch of style. It could have easily been in black, but it just wouldn’t have looked as good. You’ll see little touches like this throughout the bag. It just feels quality, well thought out and structured. The middle section is where the laptop is stored. Before I bought this Wenger Legacy 17” laptop case, I was concerned that the padding on the bag wouldnio’t be sufficient to protect my MacBook. I shouldn’t have worried. The padding is extensive. Front and back are well protected, the laptop itself has it’s own internal pocket to add further security and the top, side and bottom are all protected against knocks and drops. Over the 4 years I’ve had this bag, I’ve used it to transport my MacBook, my MacBook Air, iPads, Kindles and spare hard drives. None of them have every been damaged in anyway, despite me dropping the bag on several occasions. The middle section unzips completely allowing you to lay the bag open completely flat. This is perfect for going through airport security. You know that you can access your laptop quickly if needed, while the other sections make sure your belongings are safely tucked away. The back section features the same padding as the middle section, a nice touch I thought as some other bags I’ve used offer protection for the laptop but leave the front and back equipment at risk. This third section doesn’t unzip completely unlike the middle section but it huge and you can easily use this to take a change of clothes if you’re wanting to use this as an overnight bag. A couple of final things to mention, on the back of the bag is another Velcro strap just underneath the back handle. This unfastens in the middle allowing the entire bag to be slipped over the handle of a large case’s carry handle. I’ve used this several times when traveling and it really makes the difference not having to carry the bag separately but know that everything is secure and attached to my larger suitcase. The last thing to mention is the quality of the stitching. It’s rock solid. The bag shows little sign of wear and tear. You can see for yourself in the pictures, it looks as good today as when it was first purchased.This bag can be purchased from majority of office supply outlet near you. To bring this review of the Wenger Legacy 17” laptop case to a close, this is without a doubt my favourite business bag I’ve ever used. It’s never let me down, is smart enough for any meeting, and large enough to carry all the various bits of equipment I need. All safe in the knowledge that my gear is protected, ready to hand and always reliable. This is a no brainer purchase.